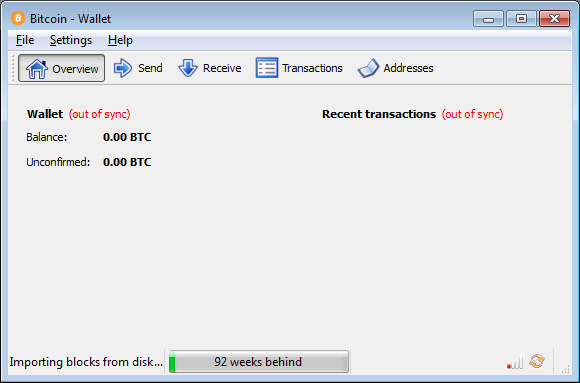 If you are just getting into Bitcoins and started by installing the Bitcoin wallet on your computer you may notice that the synchronization process with the Bitcoin network is taking up quite some time. This is due to the very large blockchain that has been generated so far and it will continue to grow even bigger, so besides more than 10 Gigabytes of space you need to be ready to wait a bit. There is however a clever solution that might speed thing up, you can download a file to help you import most of the blockchain locally much faster and then synchronize with the rest of the network in no time. – Download and install the Bitcoin wallet software, run it and then close it. – Download the bootstrap.dat file (via a torrent client). This will get you up to speed and running in no time and much faster than running the Bitcoin client and waiting for it to download and synchronize the complete blockchain from the start to the most recent blocks.